When considering the range of spatial planning actions that cities can take to adapt to climate change, many of them fall under the conceptual umbrella of green infrastructure (GI). GI has been defined as the spatial planning of landscape systems at multiple scales and within varying contexts to provide open space, safeguard natural systems, protect agricultural lands, and ensure ecological integrity for cultural, social, and ecosystem benefits (Benedict andMcMahon, Renew Resour J 20:12–17, 2002, Green infrastructure: linking landscape and communities. Island Press,Washington, DC, 2006; Ahern, Cities of the future. IWA Publishing, London, 2008). While the traditional definition of GI refers to areas of land that are least intervened by human action, in this expanded definition, we are deliberately including areas that are engineered to mimic natural processes and which provide cost-effective ecosystem services. Although climate adaptation is a fairly new policy goal for GI (Gill et al., Built Environ 33(1):115–133, 2007; CCAP, http://www.ccap.org/docs/resources/989/Green Infrastructure FINAL.pdf, 2011), three key characteristics qualify GI as a suitable tool for adaptation planning including multifunctionality (to match ecosystem benefits with adaptation needs), multi-scalar nature of the spatial elements, and a ‘no-regrets approach’. However, GI needs to be matched to the character of the urban environment and coordinated across jurisdictions and planning scales to become an effective adaptation policy. 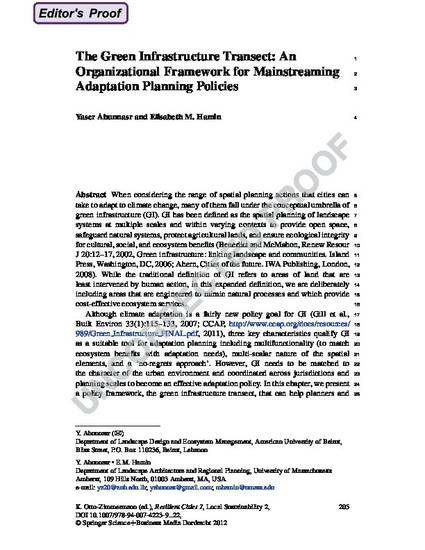 In this chapter, we present a policy framework, the green infrastructure transect, that can help planners and policymakers identify appropriate GI policies for different urban environments and describe how these policies can create a regional adaptation planning framework.